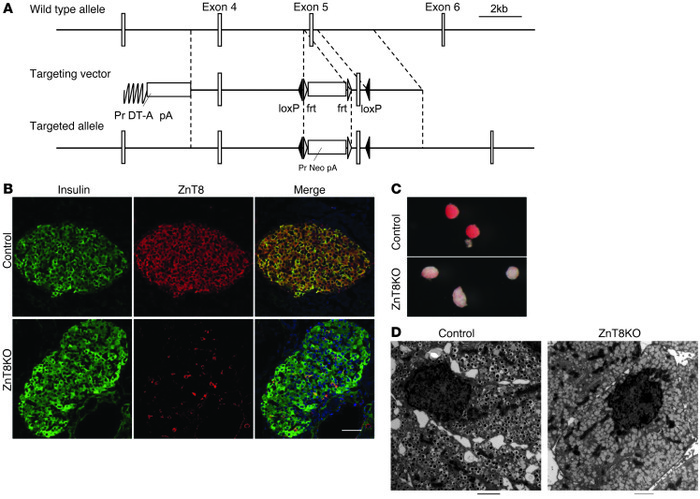 Generation of ZnT8KO (β cell–specific ZnT8-deficient) mice. (A) Generation of control Slc30a8f/f mice. (B) Immunohistochemical analysis of the pancreas of control and ZnT8KO mice. The pancreas was immunostained for insulin (green) and ZnT8 (red). (C) Dithizone staining of islets of control and ZnT8KO mice. (D) Electron microscopic images of β cells. Scale bars: 50 μm (B); 2 μm (D). For C, information on magnification was not available.